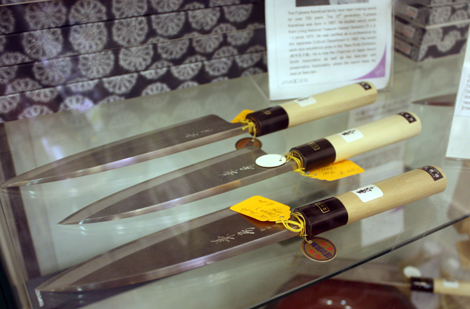 Each knife is handmade by the 25th generation of the Kanefusa family who have been making knives for over 700 years. They use the same method used to make samurai swords, by forging together high carbon steel for the edge, with soft iron for the body. The result is an extremely hard cutting edge that is so sharp that it can even preserve the freshness of the food being cut. Unlike Western knives that often have a double-beveled cutting edge, only one side holds the cutting edge, which means there can be a cleaner cut, though more skill is required. They are also corrosion resistant and are able to keep their sharpness for longer than most ordinary kitchen knives. Prices range from £97.49 to £345.99. Posted in Food and tagged sashimi. Bookmark the permalink. The knives and the description in the web are very impressive. But…where can we/I(the interester) find these thick nice knives. Do we have to go to Japan or can we order them?